On February 8th, 2016, another new semester and the beginning of a life-changing journey was launched with THE SPARK of Le Flambeau. This program is part of a unique language exchange initiative now in its eighth year, born of the collaborative efforts of Le Flambeau Foundation, student leaders, IT advisers and volunteer educators. The objective of the program is to help with language fluency, cultural exchange, and overall growth; serving as a college and job preparatory tool. This particular session revolves around an English dialogue for students in Haiti. The youth help each other, each serving as mentor and mentee. 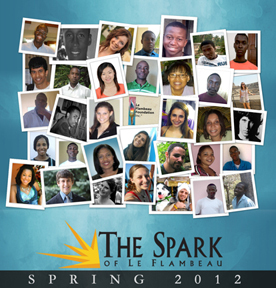 THE SPARK of Le Flambeau program continues to grow in its membership and in its impact. This semester we have a full class, bringing in a number of first-timers in Haiti. We are also pleased to have our youth English Grader, Ms. Bijou, join us this semester. This class will run for four weeks. An exciting session of English dialogue on various topics is on-going. We can each make a difference. THE SPARK of Le Flambeau is another opportunity for students, teachers, and supporters to reach out and be that difference. Of the lives to be changed as a result of this experience one may very well be your own. In whatever you do – Be THE SPARK of Le Flambeau!